Organic Power put together the design concept for a dedicated vehicle fuelled by renewable natural gas, as advertising for its technology. DaimlerChrysler produced 50 of these seven seater people carrier EcoVito vehicles, the majority of which were sold to Eco-Transit SBN BHD in Malaysia. In order to provide additional funding and so as not to detract from the core business of Organic Power, EcoTransit Ltd was formed and separately funded. The first two Mercedes EcoVito vehicles off the production line were bought by EcoTransit Ltd which continues to promote Organic Power’s technology and to market and develop the gas vehicle opportunities which the Maltin® System provides. Biomethane is the world’s most environmentally friendly vehicle fuel. The route to having vehicles being powered by biomethane is to begin by having them fuelled by natural gas and then to replace this fossil fuel natural gas with biomethane when the use of Natural Gas Vehicles has become established. This is what has happened, or is happening, in other countries around the world. There are over 8.5 million gas vehicles on the road, growing by over 20% per year. Sadly, the UK does not even feature in this list. Germany is committed to building over 1,000 gas refuelling stations and will substitute 10% of all the fossil fuel natural gas with biomethane from wastes by 2010. 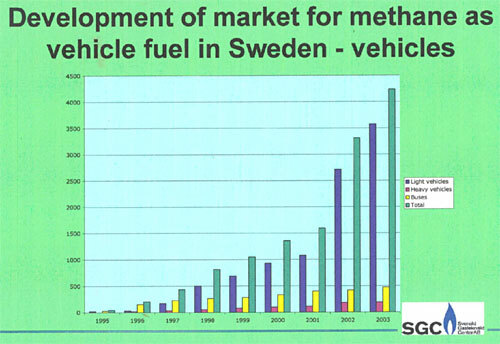 The majority of the gas vehicles in Sweden already operate on biomethane from wastes. Sweden intends to be completely free of fossil fuels by 2012.